I was surprised by a good friend last night in the gallery. We had a great time catching up while talking with customers. One of the conversations led to travel and flying. Her husband said that he hated to do it. It made me mentally pause, wondering why, and if I should be concerned. Then this morning I woke to the NYTimes Travel edition on my computer. They wrote about a pilot’s point of view regarding safety in the skies. So, relevant to last night, that I had to read it. It quieted some of my concerns about the regional jets and I know I will be on a plane in the near future. It has been a busy day in the gallery. A very good thing. I have several people come in from yesterday. They had watched me throw Yunomi’s and wanted to see them finished. You will see several trimmed and one not yet finished. These are in porcelain. 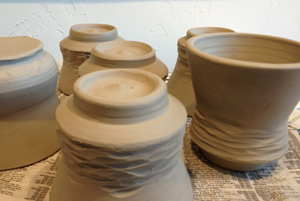 They will be great with a Celadon and/or Tenmoku glaze. Time to close the shop. Get some sleep and start another day. Enjoy your evening. C.